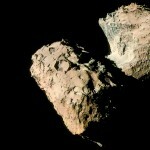 View from the comet’s neck. 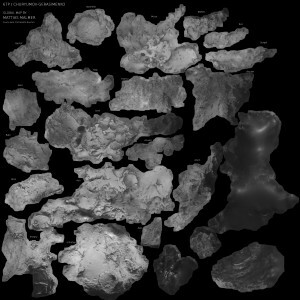 I am very happy to show these 360 spins of 67P that I created for Dr. Joel Parker (PI of the ALICE instrument on Rosetta). 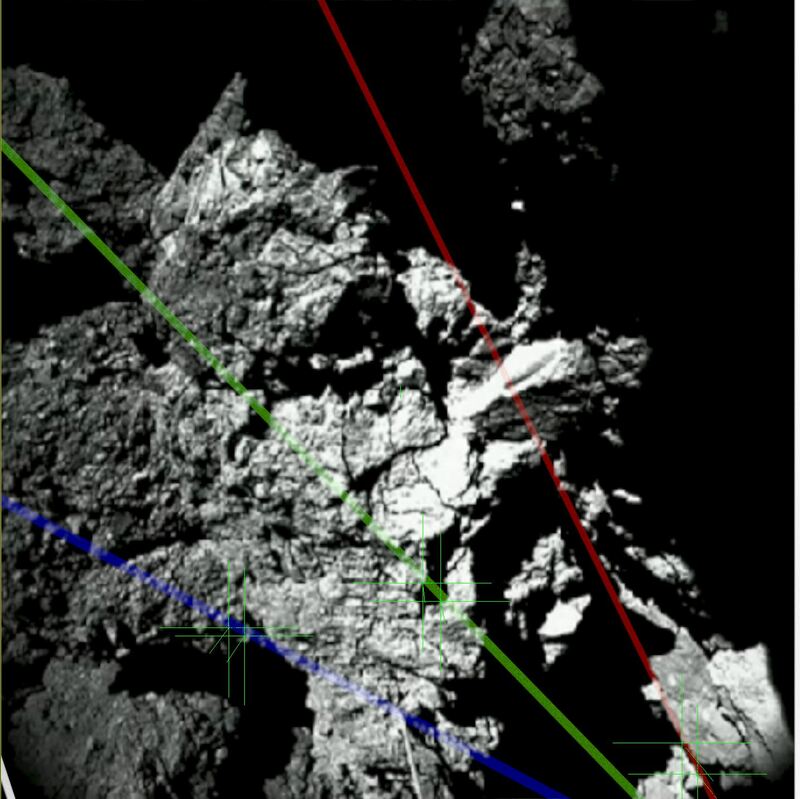 He used them in his Lecture: “Catching a Comet with the Rosetta Spacecraft“. It was held at the Fiske Planetarium in Boulder Colorado. I wish I could have been there to see it. I made four versions. Two with cg dust added for illustration and two without. The new model and its high resolution textures will be made available later on. Just playing with the color image. 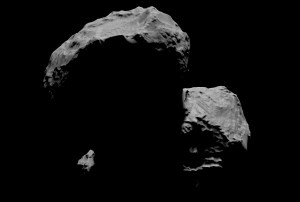 I felt that the all gray comet image left me slightly wanting. Just gray is ok. But I wanted to see what was hidden in the JPG. I aligned the 3 channels very carefully using my shapemodel. I then carefully balanced the channels so that i could increase the saturation. I let the final result simmer in a pot of some of my image tricks that I use when I only want a pretty picture as result. It is as good as I believe can be done with the current limited data-set. 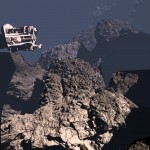 It is built by correlating 150 surface features over 120 navcam and OSIRIS frames. Each image has had its viewing geometry reconstructed using sparse bundle adjustment. Then a select number of images where used to derive dense depth from stereo data. To combat the noise in the stereo data I used shape from shading to create high resolution local data. There are areas especially around the neck with artifacts and seams. I have not fixed them because the model is continuously made obsolete by the steady stream of new images being released. I would like to be credited for the creation of the model and a link to this blog would be appreciated. Added some depth cues to the CIVA panorama. It really helps to create a sense of depth and scale. 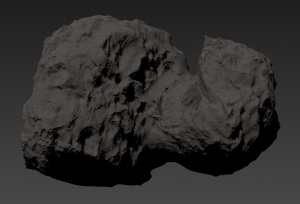 I segmented the image boulder for boulder looking for overlapping sillhouettes. That created the initial sorting. Then I used the shadows and the scale of the surface grain to estimate distance. I coloured the surface redish to match with some information on colour that I have seen drifting around on the web.. I added the contrast loss that an atmosphere/fog would give based on the distance estimates. 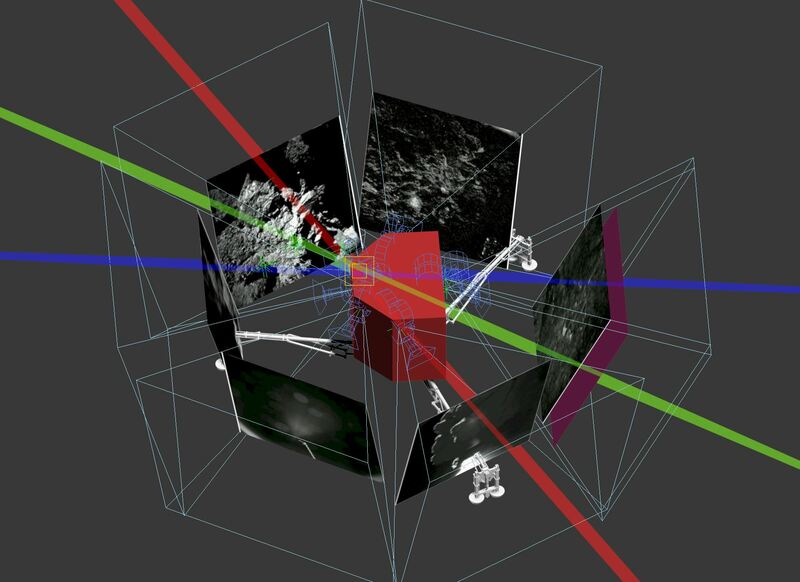 I spent some time reconstructing the vector to the sun in the Philae CIVA panorama images. If one can see an object and its corresponding shadow in an image one can construct a plane using the cameras position and the two vectors pointing from the camera to the shadow and its caster. The sun is located somewhere on that plane. If one has more than one object with an corresponding shadow one can create multiple planes. And the line that is created in the intersection of those planes will point at the sun. This approah worked very well for that image. 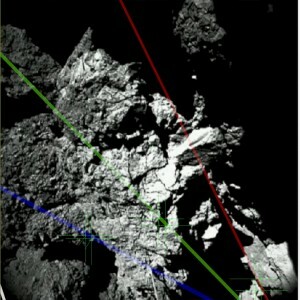 This image is looking down at philae from the sun. The sun is in the intersection of the three coloured lines that are the intersecting planes seen edge on. This image shows which shadows I used. 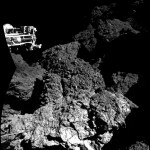 (I found the shadows in the vastly better resolved mosaic released by ESA. 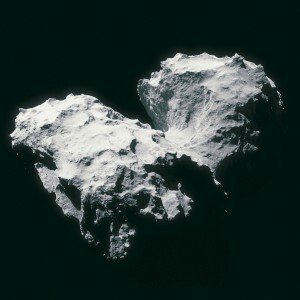 I then transferred them to this square image.) The green cross gizmos are the shadow/caster pairs and the red green and blue lines are actually the planes constructed seen edge on. Navcam images registered on my shapemodel. I am very happy with how well the model matches. There are very few alignment errors.